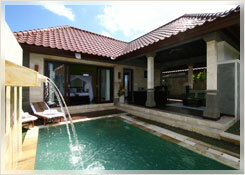 Prime Private Villas and Spa is a sanctuary of tropical splendor. It’s a world class contemporary resort with a team of attentive yet discreet staff who are committed to providing exceptional service. 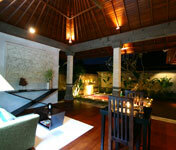 Lavishly adorned villas with their chic interiors will astonish discerning leisure and business travelers alike. 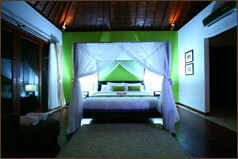 The villas provide guest with a sense of privacy and ultimate luxury; far superior to hotel room environment. Prime Villas is an exclusive ensemble of 9 luxurious villas based in 8 units of one bedroom villas and 1 unit of two bedrooms villa. 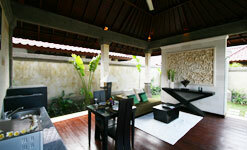 All set in idyllic landscaped gardens with private pools. Modern chic yet elegantly designed villa which suitable for your escapade in the tropical island and freely entertaining friends in privacy. Completed with private pool and beautiful tropical garden and poolside bale and also sundeck and reclining loungers to spend the day under the sun.